We are once again, planning a “Blessing of the Bunnies” at MWBF 2016. The Blessing of The Animals will take on a new life as Minister Amy Gregory Mott, ordained by Universal Life Church, will bring forth a Blessing of the Bunnies. This special event will consist of a non-denominational meditation and blessing suitable for all religious and spiritual beliefs. All are welcome to attend this "quiet" moment of peace and love. Please feel free to join us for the Blessing which will take place in Education Session Room A from 12:15 PM- 12:30PM. 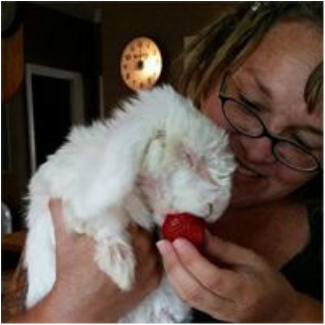 About Amy Mott: Amy is the President and Founder of Clover Patch Sanctuary Inc. ( a 501(c)3 Non Profit charity) and longtime supporter on Midwest BunFest and the Ohio House Rabbit Rescue. She is a 16 year animal rescuer that has devoted most of her free time to the education of rabbits & ducks. She can be heard on her popular Facebook blog, “News from the Clover Patch”, throughout the year. Amy is a full educator for the House Rabbit Society & domestic duck rehabilitator. She lives in Franklin Tennessee with her husband, Chris and 2 children.